I want to work with horses but heard I need qualifications! Is that correct? Not always, but YES in many instances you do need qualifications. Although the Lingfield courses do not offer professional qualifications in themselves the Intermediate Diploma programmes provide the majority of the theory required, and on which you would be questioned, during the BHS and ABRS professional qualifications. So what is available and what sort of jobs can I do when qualified? The system for gaining professional qualifications depends on the type of work you want to do in the end. Working in a ‘hands on’ capacity with horses offers 3 main routes of training – with 3 different awarding body qualifications. There is also however, the more academic degree course route. This doesn’t necessarily achieve ‘hands on’ work qualifications. Some of these training systems overlap. The information we provide below aims to answer the sort of enquiries we receive here in our office. It is not an exhaustive or complete list of work/employment/positions/qualifications available. However, we have tried to cover information relating to the majority of questions we are asked regularly. Note that you should be sure to do your own research. The route which offers a lead up to a teaching/coaching qualification (or groom/stable managers qualification) would be via the British Horse Society or in the future via the ABRS (Association of British Riding Schools). The BHS route for coach/instructor etc., is the Complete Horsemanship pathway. For ABRS information on training and qualifying visit this Association of British Riding Schools link and contact them direct. Neither the BHS or ABRS offer any distance learning qualifications for this type of professional ‘exam’ (now called ‘assessment’ with the BHS). Some of the colleges also offer ‘bolt on’ BHS training alongside the National Diploma training we discuss below. The teaching profession is probably the most lucrative of the options in this system of training. Coaches quite often work at riding stables/equestrian centres or as freelance coaches and in the main, most who are working at equestrian centres will earn a little more than the minimum wage – but sometimes they are able to top their wage up by working as a freelance coach on their days off – if the riding school allows. They will however require extra coaching insurance for this. Once they have moved up the ladder a little they will of course earn more if the yard is big enough. If they are in a position to increase their skill levels and their level of qualification to an Intermediate Instructor or further to BHSI within a training yard environment, there may be more options open to them. They can then begin to build a larger client base and charge more for their freelance work. It is important to note that moving away from a yard / centre which retains a training environment however, makes it increasingly difficult to achieve the more advanced coaching qualifications. Training as you move up the ladder is more difficult to find on a part time basis. We will mainly discuss the BHS route here because that is the one we are most commonly asked about and is the qualifictions which is recognised internationally. BHS professional exams are usually called assessments today. The BHS qualifications enabling you to work hands on with horses, are of a practical nature with no written work. The theory on equine care is questioned orally during the days of the various exams or local assessments and BHS assessment days. Note: Most of the professional exams/assessments are full-on, full day practical riding and or horse management assessment exams (no written work). They command professional level exam entrance fees – it is therefore worth getting the right training – and being aware that you might have to spend time traveling to and from a good training place. An hour and a half or more would not be unusual – but it is your career you are looking at and the traveling and the time spent training is not something you will have to do forever ! This Complete Horsemanship (coach) qualification qualifies you to coach and train people and their horses and will allow you to obtain the all important insurance to teach on a freelance basis – thus also allowing you to take other routes in the future. This qualification is not so likely to help you gain work where a degree is required in an office or on the nutritional side of things – it is the hands on side of working with horses that you are aiming for with these qualifications. It is important to note that without these qualifications it is unlikely that you would be able to get any professional insurance for working as a professional in a hands on capacity within the equestrian industry – unless working for and employed by a stables which covers you whilst working on their premises. Although the BHS exams/assessments are of a practical nature, the distance learning courses we offer from Lingfield can, provide the majority of the theory knowledge on which you would be questioned orally during those BHS Stages 1 & 2 exams. They are therefore ideal for the mature student who is often working or has a busy life and cannot train full time. The distance learning courses are also useful if you aim to train in future and hope to get the theory knowledge underway before searching for practical training. Careers in most equine related therapies – such as massage and equine behaviour – also require a good grounding in practical and theoretical equine management, and many require a degree. Most qualifications require that the student is already proficient and requires a BHS Stage 2 or Stage 3 as a minimum. Professional equine behavourists/psychologists also require a related degree. Loads of our students are using our Intermediate Diploma programmes to gain the theory knowledge for their professional assessments whilst at the same time training more train locally on a part time basis for the practical side of the professional qualifications. This they usually manage to undertake reasonably locally at an equestrian centre. If you are looking to train part time, you need to find a good equestrian centre which can help you – more info below on this. Training on a part time basis means it is entirely possible to achieve the first coaching award (Stage 2 Coach Award) or even the second (Stage 3 / BHSAI) coaching qualification with the BHS. It is not however, easy to move on from that standard whilst training on a part time basis unless regularly involved in daytime work related training at a BHS Training Centre. Sometimes this part time training can be set up so that you do a little work on the yard in exchange for training. The colleges however, are not really suitable to approach for this sort of training – they use a more ‘structured timetable / course’ approach which is not ideal for those with busy lives &/ or a family. Far better in our opinion to approach equestrian centres. Read on to find out how. For ABRS information on training and qualifying visit this Association of British Riding Schools link and contact them personally. 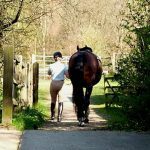 For the part time route where you use a local riding stables/equestrian centre it is fairly vital to choose a centre where they already train their staff / working pupils / students for the riding elements of the Stages. Note that it does NOT need to be listed with the BHS as a ‘Training Yard/centre. There are other general equestrian centres on their list which train staff and some offer client lessons for the Stages too. You will need to find a yard where there is an instructor who is a qualified professional BHS assessor to pass you on various aspects of practical work leading up to and prior to the final assessment day with the BHS. These final assessments are held at one of their assessment/exam centres. The exam/assessment centre could be a college or a larger equestrian centre. They are few and far between so you may have to travel some distance for that final assessment. It is after all a professional qualification for a professional career you are going for so you must realise that this is not a simple ‘test passing’ situation. The BHS will send you a ‘Skills Record’ when you first apply to them for the qualification at the start of your training. The ‘skills record’ cannot be a copy downloaded from their website – it must be the one sent to you by the BHS when you apply for professional assessment. It must be signed off by your local BHS assessor instructor. (your instructor assessor will probably be able to help you with this). b) who offer ‘training’ on their website for the BHS qualifications (Stages). As mentioned earlier, you may find you have to travel for at least an hour or maybe two to find a decent place to train – but if it is for your career training it will be worth traveling costs and time. It is important to find a good place. You have to remember that you may have to make sacrifices to achieve your goal. Career training is rarely available to you on your doorstep and the cost is never minimal for career qualifications. Having found a suitable equestrian centre or a selection of stables/centres in your region, check them ALL out by visiting them after you have first made contact by phone. TIP: Do not email !! Most equestrian centres get loads of similar emails and phone calls from people looking to get trained as a riding instructor – but few people follow it through. The centres therefore, don’t take people very seriously unless they sound seriously keen and motivated and explain also that they understand that they will have to start at the bottom. You will therefore, need to sound really keen, motivated and very serious about it on the phone. Ask to speak to the person in charge of training – not just the receptionist or groom who answers the phone! Explain that you are making a serious enquiry regarding ‘training for BHS exams/assessments’ at their centre. It is important to realise that no matter how experienced you are that unless you qualify for direct entry to Stage 2 by showing proof of other pre gained qualifications (NVQ Level 1 or perhaps recent Pony Club B or A tests) you will have to start at the bottom. All career training is the same, you start at the bottom whether it be accountant, car mechanic, solicitor or hairdresser. You will not be accepted as a self assessed ‘experienced’ person, you will have to show by professional assessment that you can undertake the simple riding work and easy tasks before being considered safe and suitable to move on to the more experienced work. Find out how long they have been there. A quick turnover of staff is not good. If you are looking for training for a young person or aiming to work full time during your training you should ask: Do the staff live in? – do they have decent, warm and dry accommodation and do they get any meals cooked for them? Youngsters may need to learn how to cook their own meals. Check the accommodation out personally – think about it seriously and whether it is suitable for Winter conditions, food storage and cooking, drying wet clothes etc. What days off do they get (Apprentices of 16/17 should get two consecutive days off). Find out if that is set in stone. Are they happy – is it a happy yard. How many hours ‘structured’ training do their staff or trainees get a week and is this every week. What sort of training is it? Is it ridden lessons as well as working alongside and learning from other staff as they do the general practical work in the yard. This practical yard work as part of your training, might seem mundane but you need to know how you would be expected to do it at an assessment. You may have always cut corners at home and not even be aware that you do so. Working at a training yard means you would pick up or be picked up on that. Would it be possible for you to be included in the staff / client training if you were looking for part time training – and how much would it cost per hour. As an alternative could ask if you put in a couple of days work in exchange for training – maybe working at the weekend for them. Ask if there is any chance they can work something out – you might have to be flexible. If it is obvious that you are prepared to help them, they are more likely to accommodate you. If you already work full time, remember also that staff training is unlikely to be undertaken at weekends – that is the time when the centre is catering to the paying public and there is not time to fit in staff training as well. It is important to find this sort of thing out – that way you know if the yard looks after their staff and will offer some proper structured training. Many yards tell prospective employees that they will ‘train them’ – but in the final outcome they don’t offer structured ‘actual’ training. They simply offer ‘experience’ on the yard which could be considered ‘training’ in the broadest sense of the word but is not structured or considered to be training by the employee. Some riding stables/schools offer evening lessons for riding school clients for the BHS Stages exams/assessments. These are ideal if you work full time. Lingfield Intermediate Diplomas can provide the majority of the theory for the exams so you may need simply to join the evening riding training lessons. Check all centres websites carefully for any ‘Training’ section. Remember to look at the Enjoy Riding section – do not just look at the BHS ‘Training’ yards. Some of the yards on the Enjoy Riding section also ‘train’ but are not necessarily classed only as training yards. So to be sure to search the all centres on the BHS website and the ABRS site too. What to look for: To find ‘approved’ yards in your area, you can look at this section of the BHS site and put your post code in. Remember that we pointed out earlier – you might have to travel for over an hour or more to get decent training but that is not unusual for good career training. You may also have to take time off work or find someone to look after your children/horse/dog. You will need to put a good amount of time aside for this training – but if you want to change careers it will be worth both the time and sacrifices. Experienced riders/owners: Those who are experienced often wonder why they have to start at the bottom and why it will all take so long. Genuinely professional career training and qualification is not something you can undertake in a couple of weeks. It always take a while and you always have to start at the bottom and work your way up. The ABRS as explained, is currently revamping their training system but many of their Approved yards also train people for the BHS Stages. Look on their website too for places near you. They also offer an instructors qualification and this option can include the UKCC we mentioned earlier. The UK Coaching Certificate is a national generic coaching qualification used by many sports and will at Level 2 enable you to get private insurance cover for teaching/coaching/training horses and riders. Plenty of people do train on a part time basis. At least 2 of our tutors did it this way as do hundreds of other coaches. It does take a bit longer than full time training. Career training is not cheap – hence the debt so many youngsters finish up with after taking their degree course. Whichever route you take to gaining a hands on qualification, you will need to get that theory knowledge on equine care under your belt. You will be questioned on it during your assessments and there is quite a lot of information and knowledge to take on board. For this reason unless you are happy to simply read books and are sure you are reading the right books, we would suggest that taking a distance learning course from Lingfield or somewhere like us (example is the Intermediate Diploma which includes our Levels 1 & 2 courses). These learning programmes could not offer professional qualifications because they are all distance learning. They would however, get some of that theory behind you and get you bang up to date too. They would be a good stepping stone and would help you get started with your professional training. Used alongside other part time practical training, gained somewhere more locally to your home base, you would find our courses would help enormously in reaching your final goal of gaining professional qualifications in future. The Reviews section of our site proves this to be true over and over again. Having gained a professional ‘hands on’ qualification to BHSAI / Stage 3 Level you have achieved good all round equine management, horse training and coaching and could then branch out and specialise in a specific area or discipline if you wished. If you have found ANY of the above information useful it would really help us and others if you could drop us a simple email to lingfieldcourses@horse-care.co.uk to tell us it was helpful. Thank you. UKCC qualifications are an option with other disciplines too (carriage driving for instance) and will provide suitable qualifications to obtain the all important insurance for freelance teaching. The BHS have for some reason dropped the UKCC qualification in the last few years – reason unknown. People often ask if there is a good website for vacancies: Check out the British Grooms Association website for positions available – then look at other equine career companies – recruitment agencies. There are several bodies which have gained accreditation rights for professional qualifications from the government education body for the National Diplomas across all industries. One of which is the equine industry. One is EQL – Equine Qualifications Limited – set up by the BHS covering only the equine industry. Another is City & Guilds and yet another is BTEC (Business and Technology Education Council). For our purposes however we will simply call these ‘government accredited bodies’ offering graded work based qualifications. These qualifications are the ‘National Diplomas’. They are a government accredited national grading system and practical qualification in equine management. However, they do not lead to instructors or coaching qualifications in their own right. Until recently this was the NVQ/SNVQ qualification which was revamped and renamed to National Diploma. They cover all industries in the same way NVQ’s did. You could get a Level 1-7 or even 8 NVQ – now you call it a Diploma instead of NVQ. The National Diploma Level 1 – 4 therefore, is the national government accrediting / awarding body route leading to national grooms qualifications and apprenticeships. This is the type of qualification you need to gain if you are aiming to work in the industry – perhaps as a groom/stable worker. Level 3 is not internationally recognised yet is a similar standard of equine management to the BHS Stage 3 at which you can become a BHSAI. The Nat. Diploma Level 3 would of course be without the teaching and lunging element. Although having gained the higher Level 4 qualification you would perhaps be considered a manager but would still be without any coaching element. This standard would normally take several years to achieve. Please Note: The grading for the ‘National Diplomas’ in Horse Care is in ‘Levels 1.2.3.4’ etc. Other organisations, accrediting bodies, companies and training providers in this industry and others, also use words such as Levels or Stages or Grades to denote their grading and standards of achievement. A Level 1 2 or 3 Diploma for instance, is not used only in the equine industry nor in the equine industry itself is it used only by the government accrediting body. Our own equine management courses also use the word Level to denote our grading system. The training is generally offered by colleges for school leavers – but parents should think carefully before going this route. College does NOT suit everyone and the course / qualifications in the end might not lead to any more than a grooms post at a local yard where you would earn the minimum wage. In fact you could train and earn at the same time rather than going to college if college is not for you. Training is offered at colleges or as an alternative, whilst working at a stables/yard which has a training relationship with and works with one of the colleges for assessments of work and standards achieved. Be aware that this route does not have a pathway to gaining teaching qualifications or professional rider qualifications. Neither the colleges or yards offer any distance learning training or route for this type of professional qualification – they are all hands on training. Llantra in recent years carried out research which confirmed that employers in the industry generally prefer BHS qualifications. Colleges gain grants for offering the National Diplomas so you generally have to pay extra for the ‘bolt on’ BHS training qualifications at college whilst at commercial equestrian centres the training for BHS qualifications is generally part and parcel of your training. Apprenticeships take 1 to 5 years to complete depending on their level. Equine apprenticeships generally offer a Level 1 or 2 diploma depending on the length of time spent studying and training. Apprenticeships have equivalent educational levels. Apprenticeships once again means the young person is working towards the ‘National Diplomas’. This qualifies you as a groom – a person who knows and understands horses and has a good all round education in horse care. The posts available on completion are usually a groom on minimum wage. To find out more on the Apprenticeship system check this link for general information. The British Grooms Association has list of positions which might be of interest. Putting on and removing horse rugs under direction. If you want to work as a groom with horses, there are various training companies (private organisations) around the country that work with small and large riding centres and even quite small yards to assist and oversee Apprenticeships and training placements. To find out if they have connections with a yard in your area you could contact them direct to explain what you personally are looking for and see if they have any placements which fit your situation. 3. The third option is via the British Grooms Association. This is the type of qualification you need to gain if you are aiming to be a Professional Groom and maybe work with competition riders: This is the qualification we would suggest to anyone who does not wish to take the BHS route. These qualifications offer a very strong and professional grooms qualification with specific yards via the Llantra accrediting route. The sort of grooms we are talking about here are quite often those who work for top riders and travel with international competitors BUT they are not all so lucky. See the British Grooms Association website for details of their Equine Skills CV (ESCV). Ask your employer or your prospective employer if they might be interested in getting involved in offering professional grooms training via the British Grooms Association / Llantra. Suggest the employer checks the site out and mention Lingfield Equine Distance Learning. The BGA are very helpful so ring and chat to them. Colleges and career advisers at schools will often cite ‘yard management’ posts could be the future role of a graduate. However, with so many students hoping to work in this area and so many students graduating there are loads of candidates for each post – most have to work their way up through from basic yard staff (groom) before reaching a management post. However, you should also remember that the majority of vacancies in riding schools and yards require practical knowledge and practical experience in the commercial world rather than a paper qualification directly from uni even though that might have entailed working with the horses at college and a placement during your years at uni. The degree courses provide you with the qualifications required to gain a position where your academic skills can be used. This is invariably an office or technical position where the sciences are a required subject – along with a good standard of education as a whole. Career training is not cheap – hence the debt so many young people (or their parents) finish up with after going to college/uni and / or taking a degree course. Such degrees would mean you are eligible to apply for positions as equine nutritionists with feed manufacturers (or on a freelance basis if you found sufficient demand) or as equestrian journalist, a racing yard secretary or a lecturer at an equine college, research and development at a university, a Racing Yard Secretary etc. etc. Physiotherapy is another route some consider – but this is quite along process – and the degree courses are not that common for animal physios – a good deal of searching is required and it is best to contact the various Registers to find out what courses and training they accept. Without the correct training you are not accepted on the register and cannot get insurance – nor generally work with vets. Chartered Physios treat humans. Chartered Physios then undergo a further two years training to become an animal physio./ It should be understaood that there is no such thing as a ‘chartered animal physio’. Journalists work for media companies – they spend a lot of time at their desk researching and contacting people and some of their time is taken with writing articles in the hope they will be published in magazines or on websites. They must be aware of the law relating to journalism. Once again they would be involved in marketing the magazine. Most would be employed in the office whilst some might have the opportunity to interview people. Working on a local newspaper is often their first inroad into working as an equestrian journalist. However, time spent out and about may be limited. This answers some of the questions about whether or not your child should go to college to train or if there is local training available ?